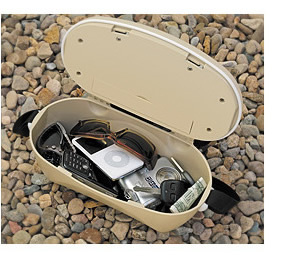 Yelpie is a convenient, weather resistant portable safe designed to store personal effects while you enjoy the great outdoors. Theft at places of leisure like beaches and swimming pools is on the increase. Combine that with the cost of items we use when we're outdoors like MP3 players, sunglasses, mobile phones, cameras and so on, and we have the potential for significant loss. Until now, there has been no product available that conveniently protects against this increasing threat. 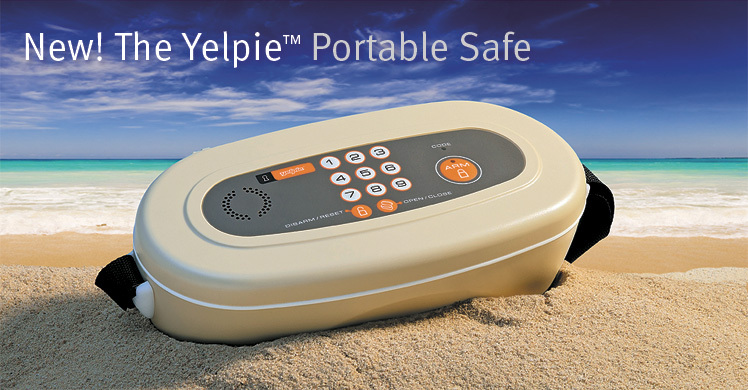 Enter the Yelpie - a patented lightweight electronic safe that provides portable protection for your valuables. Step 3: Alarm activates if disturbed for more than 2 seconds. Alarm will automatically cease if Yelpie is put down and left alone again. Step 4: To deactivate the alarm and open the Yelpie portable safe, enter your personal code using the Yelpie's strong and weatherproof keypad. No keys to be lost! Its advanced motion sensor alarm works to keep your valuables exactly where you left them, while being smart enough to know what's an accidental bump and what's an attempt to steal your belongings. If a thief attempts to move your Yelpie, a loud 90dB alarm goes off!